Measuring and control systems, stepping motors, etc. 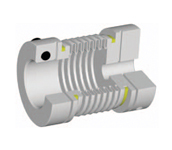 TOOLFLEX® is a metal bellow-type coupling, a coupling system which has proven its worth in the field in many cases. 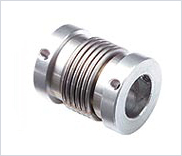 The metal bellow compensates perfectly for axial, radial and angular displacements. At the same time its geometric shape allows for high torsional stiffness and a low mass moment of inertia. TOOLFLEX® is produced in eleven sizes for maximum torques up to 340 Nm.